BRUSSELS, Belgium -- Ukraine and Georgia will not join NATO next year, the trans-Atlantic alliance's top official said Tuesday. NATO Secretary General Anders Fogh Rasmussen said Ukraine decided to end its long-standing bid to join the North Atlantic Treaty Organization while Georgia remained interested but would not become a member in 2014, Russia's RIA Novosti news service reported. Both countries will still have partnership action plans with the alliance and will still work together, Rasmussen said before a two-day NATO defense ministers' meeting began in Brussels. Ukraine and Georgia, lobbying to become NATO members for years, both enjoy full support for their bids from the United States, but alliance members rejected a proposal to offer them membership in 2008, RIA Novosti said. Russia has opposed eastward expansion by NATO, particularly when it involves former Soviet Union republics. 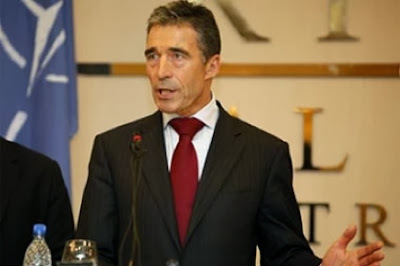 Rasmussen also said the alliance does not plan to create any new formal coalitions with the Collective Security Treaty Organization, a loose Eurasian military alliance based in Russia. Officials said NATO-Russia cooperation, improving capabilities and progress in Afghanistan were the top agenda items when the alliance's defense ministers meet Tuesday and Wednesday. The ministers also will discuss defending against cyberattacks, NATO's Ballistic Missile Defense system and review NATO reforms, NATO said on its website. Ministers also will consider the next step in the alliance's Connected Forces Initiative, focusing on NATO's training, education and exercises program after the coalition force's mission in Afghanistan ends in 2014. A NATO-Russia Council is planned for Wednesday, officials said. Among other things, NATO ministers and Russian Defense Minister Sergey Shoygu will discuss international security issues, including Syria. Ukraine do not need to be a NATO member at all, and if such decision ever to be considered it must be done jointly with Russia, Belarus and Kazakhstan. But reformed Ukraine with AA agreement is signed will finally find its middle ground between EU and Russia insuring country's stability for many years to come. Ukraine does not need permission from 'your' mother Russia or its minions. Ukraine can do whatever it wants whenever it wants.